By a HARD problem, we mean a problem that is PSPACE-, DEXPTIME-, NEXPTIME-hard, etc. Many basic algorithmically-solvable problems, for quantified formulas, for sequential circuits, for combinatorial games, and for problems when instances are specified hierarchically or periodically are known to be HARD. Analogous to what has occurred for NP-complete problems, it often makes sense to talk about the complexities of the approxi-mation problems associated with these HARD problems. Here, we survey our results on the complexities of such approximation problems, emphasizing our results for hierarchically-and periodically-specified problems. These results include the first collection of PTASs, for natural PSPACE-complete, DEXPTIME-complete, and NEXPTIME-complete problems in the literature. In contrast, these results also include a number of new results showing that related approximation problems are HARD. “Local” approximation-preserving reductions between problems can be extended to efficient approximation-preserving reductions between these problems, when instances are hierarchically- or periodically-specified. Such reductions can be used both to obtain efficient approximation algorithms and to prove approximation problems are HARD. Hierarchically- and periodically-specified problems are often HARD. But, they also are often efficiently approximable. 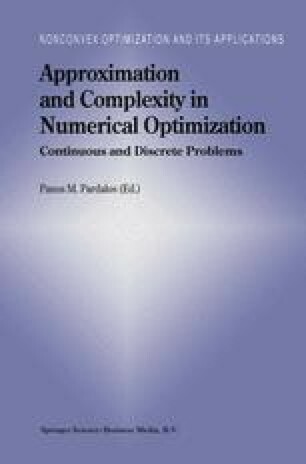 The efficient decomposability of problems and problem instances and the compatibility of such decompositions with the structure of hierarchical- or periodic-specifications play central roles in the development of efficient approximation algorithms, for the problems when hierarchically- or periodically-specified. Succinct Specifications Computational Complexity Efficient and Non-Efficient Approximability. A. Condon, J. Feigenbaum, C. Lund and P. Shor, “Probabilistically Checkable Debate Systems and Approximation Algorithms for PSPACE-Hard Functions,” in Chicago Journal of Theoretical Computer Science, Vol. 1995, No. 4. http://www.cs.uchicago.edu/publications/cjtcs/articles/1995/4/contents.html.